2. Preheat oven to 400ºF. On a rimmed baking sheet, toss asparagus with 2 tablespoons olive oil and a sprinkle of salt/pepper. 3. Bake for 15 minutes, stirring once halfway through. Remove from oven and chop into 1″ pieces. Set aside. If you’re serving this with salmon, you can bake your salmon at this time also. 4. Heat 2 tablespoons olive oil in a saucepan over medium-low heat. Add in onions and cook, stirring frequently, until softened, about 7 minutes. 5. Stir in garlic and cook until fragrant, 1 minute. Stir in arborio rice and cook for 2 minutes. 6. Pour in 1 can Earth’s Finest Coconut Milk Light and increase heat to bring mixture to a simmer. Stir frequently until coconut milk is absorbed. 7. Then add in 1/2 of the next Earth’s Finest Coconut Milk Light can. Stir (being sure to scrape the bottom of the pan) until the coconut milk absorbs into the rice. Then add in the remaining coconut milk and stir until absorbed. 8. 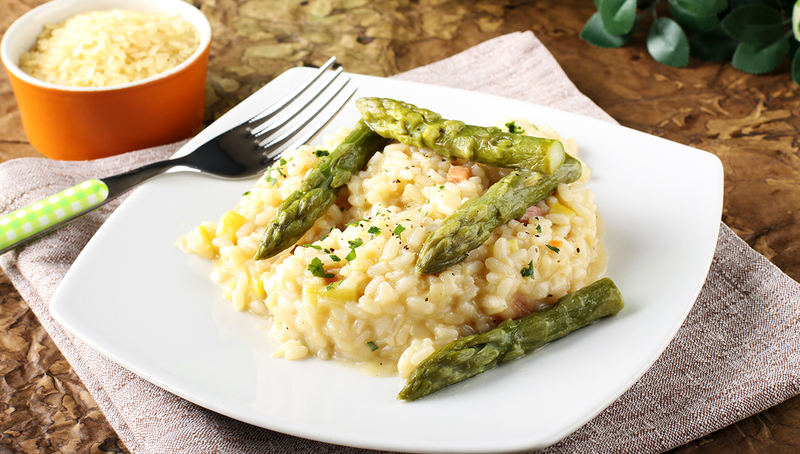 Stir in parmesan, salt and chopped asparagus. 9. Make sauce by whisking together olive oil, lime juice and sriracha. Top rice with protein of choice and drizzle with sauce.